The extended dry spell may be coming to an end. I won't get too excited until the rain actually falls since a lot of rainy forecasts lately have not panned out. Nevertheless, I'm cautiously optimistic that we are about to turn the corner towards wetter and better times. 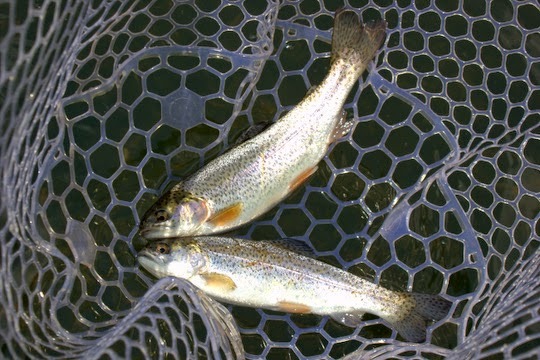 If you are looking to fish the Park, remember that fishing can improve drastically whenever the river spikes up. Just be careful for rapidly rising water and flash floods. Lightning is always a concern as well. Temperatures are up and stream flows are down around middle and eastern Tennessee. 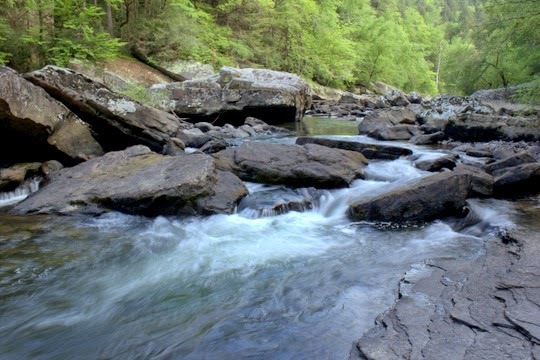 Across the Smokies, we are experiencing flows normally reserved for August and September. 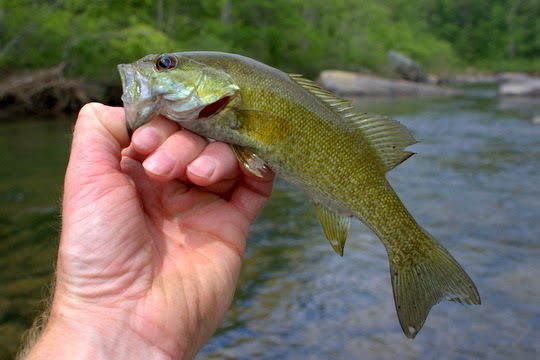 Same thing goes for the Cumberland Plateau smallmouth bass streams which, by the way, are fishing well even with the low water. Are we on the verge of a drought? Only time will tell. The one bright spot under these conditions are the great tailwater fisheries across the state. 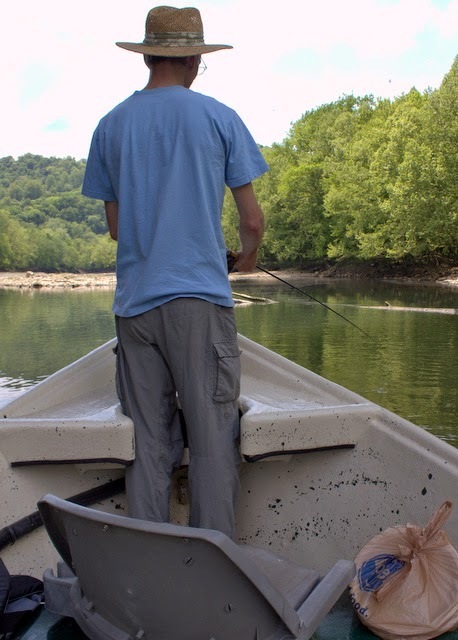 The Caney Fork has been fishing well most of the time. 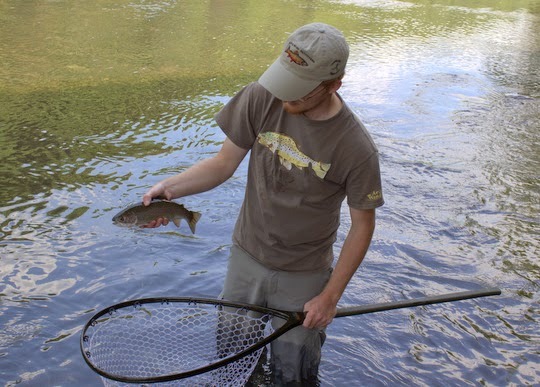 During the slower periods, a few quick fly changes have kept us catching fish. Sometimes different fish are eating from different menus. 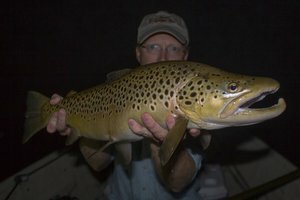 Last Thursday I fished the Caney to explore a couple of spots. Lots of fish were obviously in the river, but they were tougher to catch than the previous week. 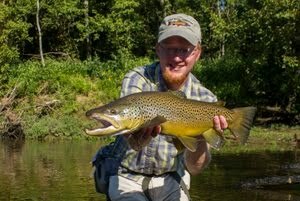 After a few fly changes, the hot fly was located, and then my rod was bent for a couple of hours. During the excitement, I did pause long enough to take a couple of stomach samples. You have to be extremely careful if you are going to do this and avoid sampling any fish less than 12 inches. However, the results were intriguing. Just to confirm, I tied on one of the usual patterns we fish out of the boat and then dropped a much more exact imitation of the obvious menu item that showed up in both samples. 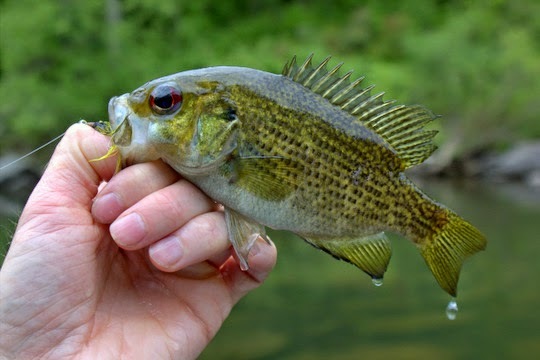 The pattern that killed them the previous week was getting one hit for every 10 fish I caught on the hatch matching fly. Big surprise there I'm sure, but the point is that if you aren't catching fish, keep on changing patterns or put your face down to the surface and look for bugs. Later in the day, further down the river, I found out again that the fish didn't want the "usual" pattern so I started changing. Surprisingly they didn't want the second one either. Seeing some Sulfurs hatching got me excited and I tried dry and nymph versions of those. Nada. Finally, after seeing a few caddis flutter by, I tied on a favorite caddis pupa pattern and was immediately back into fish including this beautiful brown trout. Notice the fleece jacket sleeve on my arm. The high temperature here at home never got out of the low 50s last Thursday! I briefly thought I had died and gone to Heaven the Rocky Mountain high country. With the low clear water, long casts and leaders were mandatory if I wanted to actually catch fish. If you are planning on floating with me, I would suggest considering brushing up on your casting before you come out for the day. It will help you enjoy your trip a lot more if you haven't been consistently casting 40-50 feet. 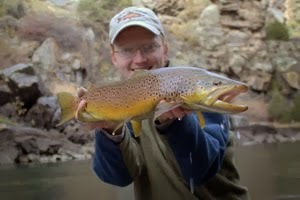 When I fish in the mountains, I rarely cast more than 20 feet so I can often go long stretches without a longer cast. Heading out to my favorite casting pond gets me back in the zone for a great day of fishing no matter where I plan to fish. 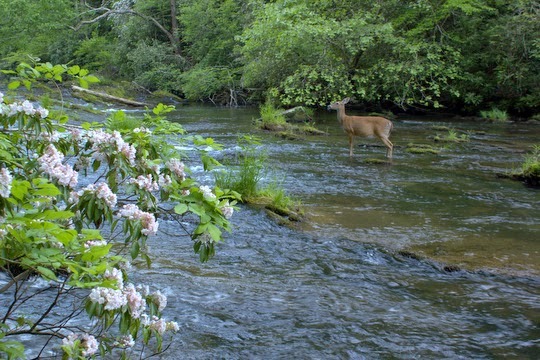 Over in the Smokies, we are seeing more and more of an emphasis on small and medium sized streams. Just a little bit of rain will change that, however. This week we have a good chance of rain just about every day so hopefully the streams will rise a bit and fishing will return to normal. If not, keep chasing those Smoky Mountain jewels on the steeper mid and high elevation streams. Despite the low water, conditions remain good for both fish and fishermen as long as you come prepared with low water stealth mode enabled. Last Wednesday, Logan and Rick were up to enjoy some time in the mountains and wanted to enjoy a new to them stream in Cades Cove. After telling them that the conditions were a bit less than optimal, they still wanted to try Abrams Creek so we decided on a late day trip (1/2 day trip) and hope for an evening hatch. The fishing ended up being very good despite very low water conditions. Logan worked hard to learn some high stick nymphing techniques without a strike indicator and was soon catching hungry rainbow trout. Rick caught on quickly to our Smoky Mountain fishing techniques despite being more of a tailwater guy. 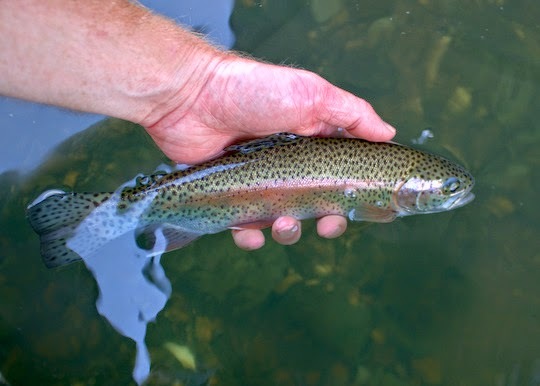 By the end of the evening, both guys had caught numerous rainbows up to 9 or 10 inches on both dry flies and nymphs. We witnessed a good variety of bugs but the hatch was never as concentrated as I was hoping for. That didn't prevent the fish from feeding though! Here is Logan with a nice rainbow trout. 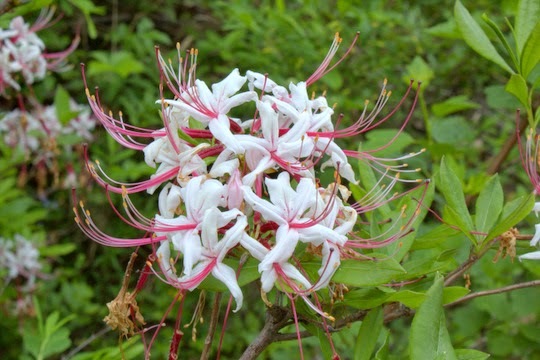 The Mountain Laurel is in bloom in the Smokies right now. That made for some incredible photo opportunities along the stream. The highlight of the evening was when a deer waded out across the slick ledges and posed midstream for us. 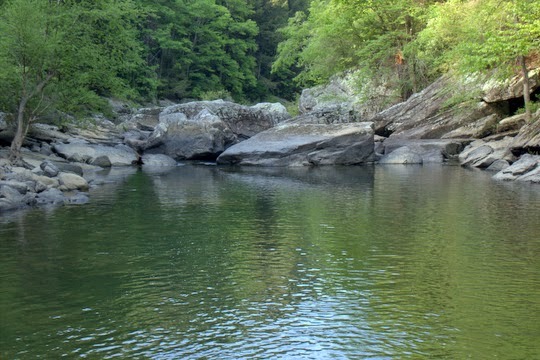 With the rain in the forecast, I expect good things for the fishing in the mountains. Hopefully we won't receive too much that we get the tailwaters messed up. The Caney is in great shape for drifting right now so don't delay if you want to get a trip in. I'm avoiding the river on the weekends and hitting it when the crowds moderate slightly during the week. The next two weeks are booked solid but I do have some opening starting after that. 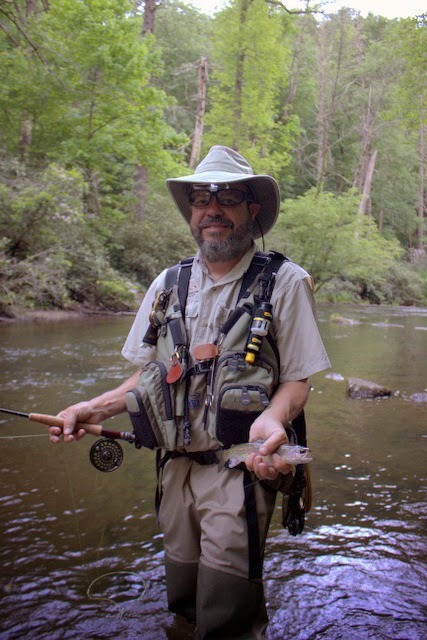 If I can help you with a guided fly fishing trip in the Smokies or on the Caney Fork River, please contact me via email at TroutZoneAnglers@gmail.com or call/text (931) 261-1884. 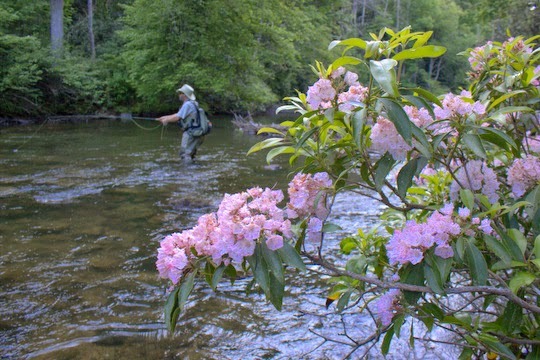 As we head into the heat of summer, Smoky Mountain anglers should begin adjusting to the changing conditions. 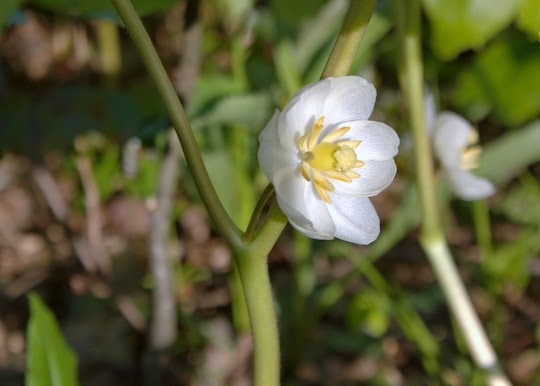 The banner hatches of April and early May are giving way to the yellow and cream insects of summer. 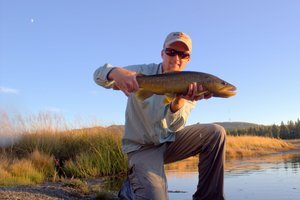 Most anyone who regularly fishes in the Park can tell you that yellow is the color to fish this time of year. There is of course, as with most things, an exception and a significant one at that. 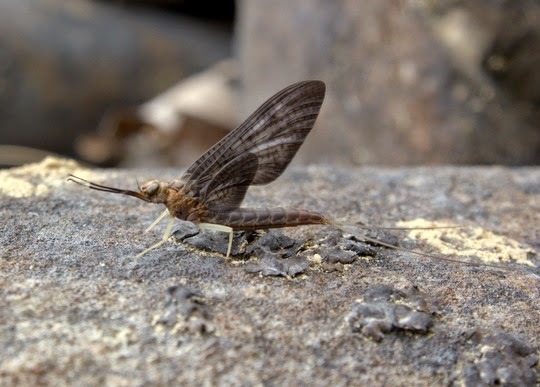 The Isonychia bicolor (Slate Drakes) mayfly is arguably as important as the famed Yellow Sallies that everyone is trying to match. 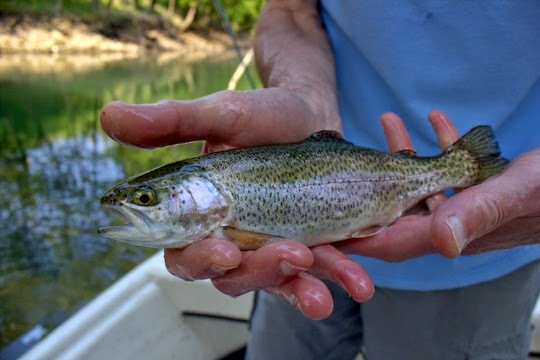 The interesting thing about this hatch is that, at least in many places, the nymph is the only important stage that fishermen need concern themselves with. 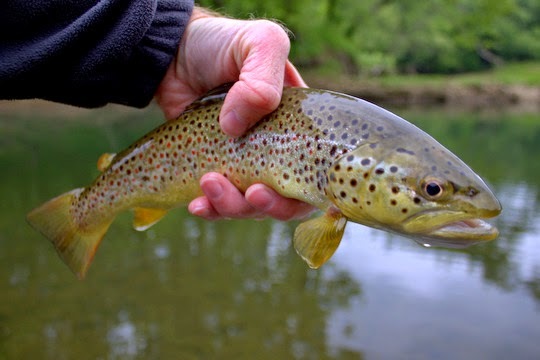 One very notable exception to this is the Hiwassee River where the duns emerge mid stream and fishing from a drift boat can produce excellent action during the hatch. 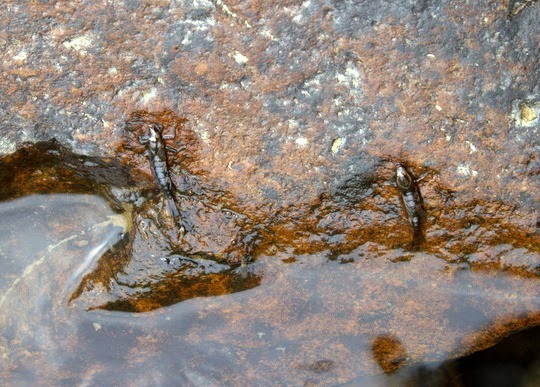 However, on the mountain streams, Isonychias generally crawl out onto the rocks in and around the stream and hatch out of the water. That means the fish rarely see a dun and the spinner falls are only rarely important, at least during legal fishing hours. 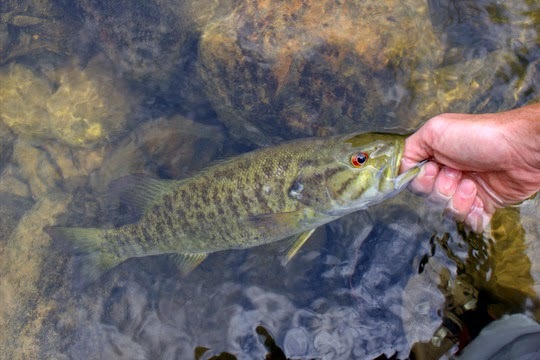 Earlier this week, I found large quantities of shucks on one of my local smallmouth bass streams and eventually a gorgeous dun that was still sitting on the rock it hatched on. Here, you can see the shucks where the nymphs crawled out of the water to hatch. The second picture is a newly hatched dun. These are large bugs, often a size #8 or #10 and the fish react accordingly. 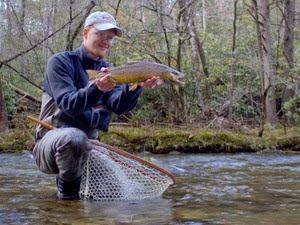 In the Smokies, trout will often take a nymph imitation when nothing else is seeming to work. 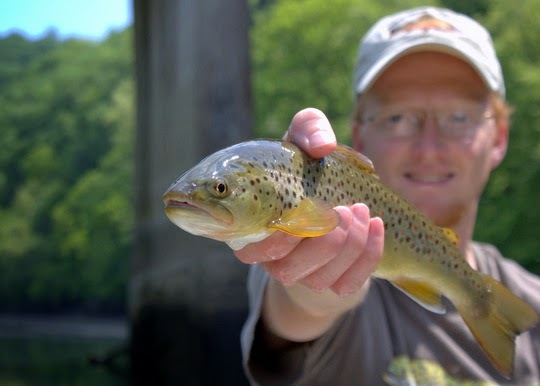 In fact, one of the better brown trout I caught last summer ate my own Isonychia pattern. If you don't have your own secret pattern, a Prince nymph does a reasonably decent job at imitating these bugs as well as a variety of commercially available Isonychia nymphs that you should be able to find at your local fly shop. 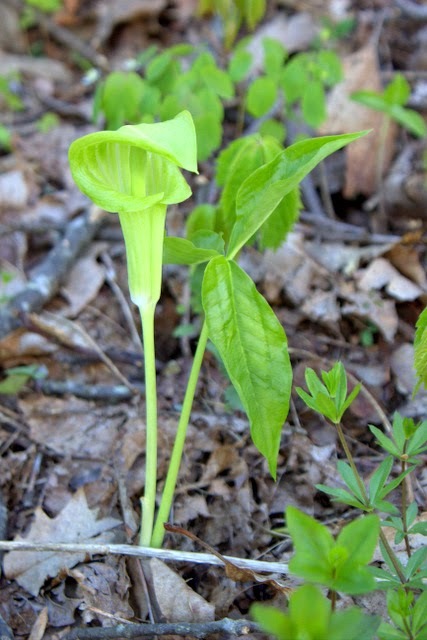 Want to take a stab at my favorite, an Isonychia Soft Hackle? Here is a picture and a recipe. Tying directions: Add wire first and then start thread and cover the wire with a thread base. Tie in tail and then flash. Tie in ostrich and then peacock herl. Wind peacock herl forward, adding more if you need it to get a nice full body. Tie off. For added durability, wind thread back and forth over body several times. 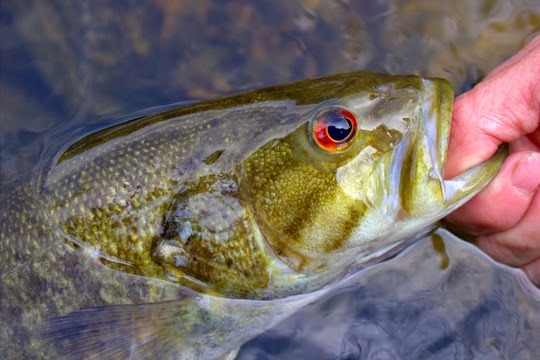 The thread will bite into the herl and should be mostly invisible but it will help hold the body together once fish start chewing on it. Next, palmer the ostrich herl forward and tie off. Pull flash strip over back and tie off behind the head. Finally, tie in soft hackle feather, wrap 2-3 turns depending on how thick the fibers are, and tie off. Whip finish and add a small drop of glue to the head and you are done! When fishing an Isonychia nymph pattern, you need to understand the naturals. The nymph is an active swimmer. This means that your normal dead drift is fine, but if that isn't working, try changing it up by adding a jigging motion with your rod tip or swinging the fly at the end of each drift. 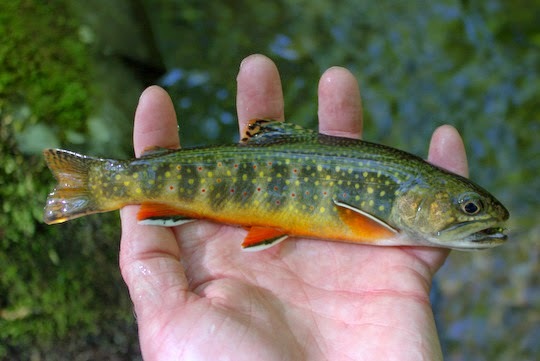 Some of the best trout that I've caught in the Smokies have come on an Isonychia nymph pattern so try one out this summer on the Little River or other larger Park stream and see if you agree that this is one of the most important hatches of the summer. This week is shaping up to be just about perfect. I'll be taking some time to spend with friends and also fish for myself. I don't get that luxury as often now that I'm guiding. 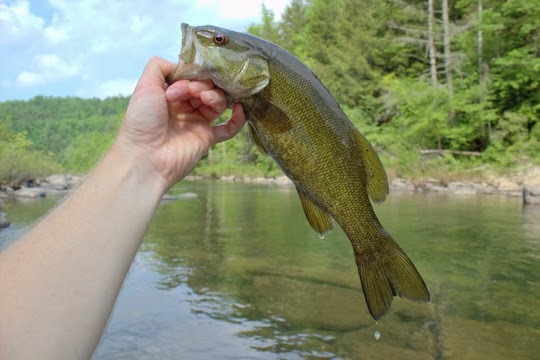 Today I kicked things off with my first local smallmouth trip of 2015. The trip was incredible in so many ways. Until I digest it a bit further and actually take the time to write about it, here is a closeup of one from today that is my best fish to date from this creek. Spring is my second favorite time of year, only barely edged out by my top favorite, fall. Yes, I love the transition seasons although summer and fall are both great as well. Summer gets a little hot and muggy and of course winter produces some slower fishing at times (although not always), but all of the seasons have their own charm. This year, spring has been glorious. Starting out cool and wet in March and early April, we have finally transitioned into late spring. 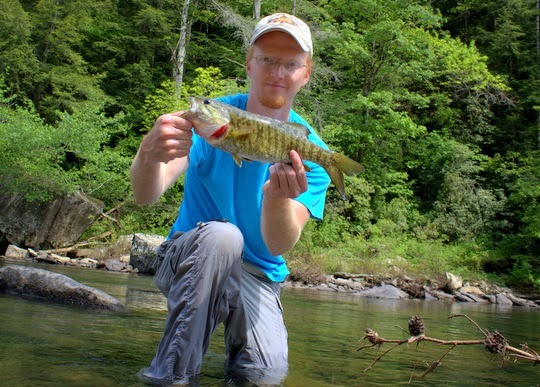 Bass are on the beds along with bluegill and shellcracker, at least up here on the Plateau. 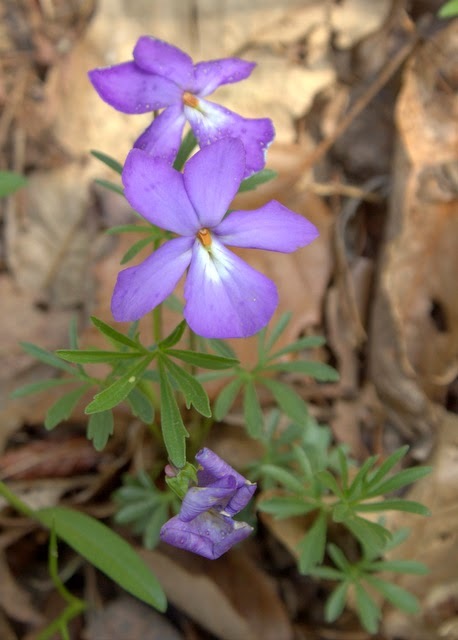 In the mountains, early spring hatches of dark colored bugs have given way to the lighter shades of summer. 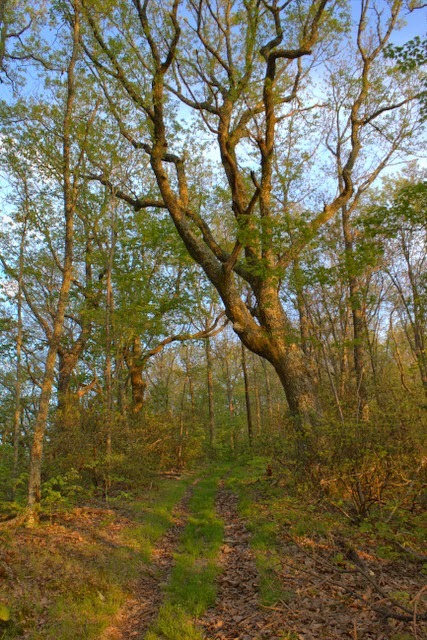 Most of the trees have finally leafed out although some are still getting going in that department. One of my favorite things about spring and fall is being able to hike comfortably without experiencing the extreme temperatures of the other two seasons. Last Saturday I headed to a favorite local hike. 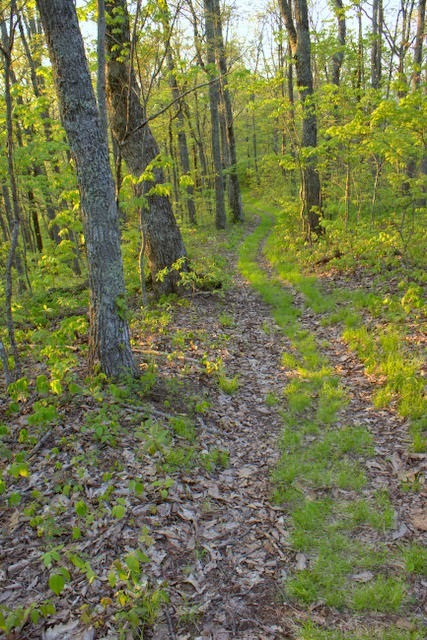 Brady Mountain has a segment of the Cumberland Trail that climbs steeply from a trailhead on highway 68 until reaching the higher elevations on top of the mountain. 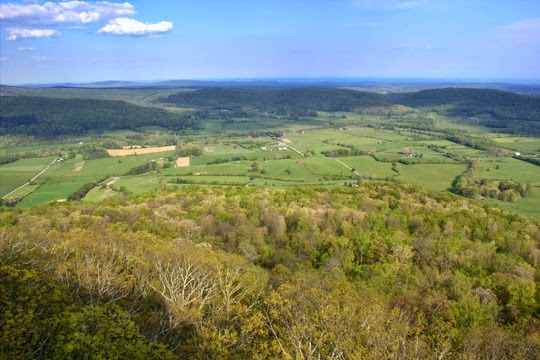 While the steepness of the mountain side can make the hike a daunting challenge, the solitude and views gained from the top make it a worth while hike. 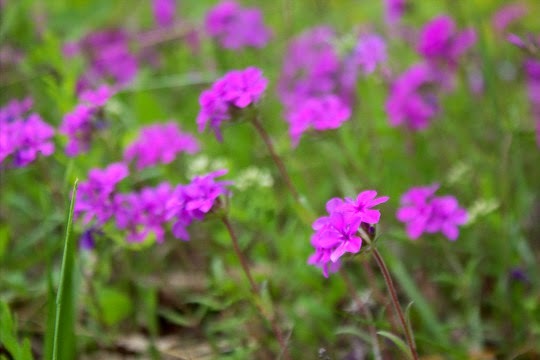 In the spring, wildflowers reign. 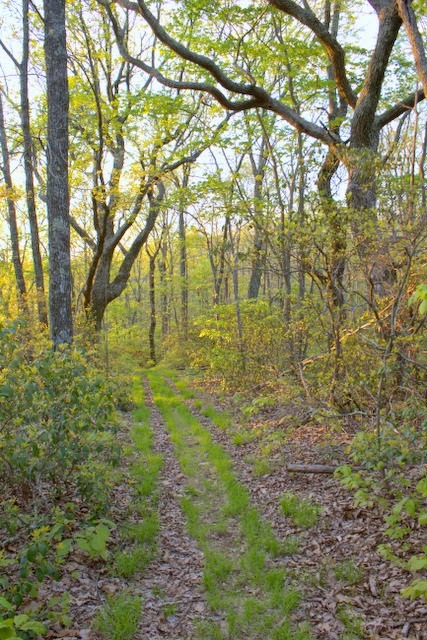 The late afternoon sunlight filtering through the fresh green of spring made for some beautiful sights in the woods. 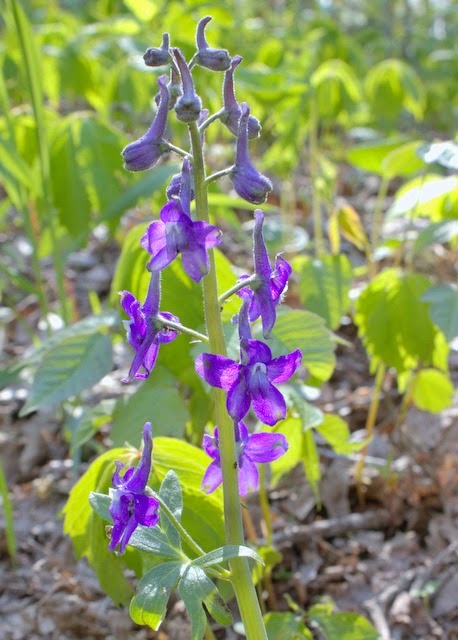 Here are some pictures from my hike this past weekend.